question_answer1) First Gulf War was fought against _________ in which troops from _________ countries fought. question_answer2) What does the word 'hegemony' imply? Eight temporary members of the U.N. Security Council are elected by the General Assembly for a period of three years. question_answer4) What is the highest functionary of the U.N. called? question_answer5) What was the basis of the report of the States Reorganization Commission? question_answer6) In which year did the Congress Party win 415 seats in the Lok Sabha? Who became the Prime Minister then? question_answer8) Which theoretical argument did Rammanohar Lohia give in defence of non-Congressism? question_answer9) What was the Anti-Arrack Movement? question_answer10) Mention any two incidents of violence against the minority community which are a threat to democracy? question_answer11) Mention any two characteristics of the Soviet Political System. question_answer12) For how many years did the civil war continue in Tajikistan? When did it come to an end? question_answer13) In the European Union flag, what does the symbol of 'twelve gold stars in a circle' signify? question_answer14) What was the 'Operation Infinite Reach' Ordered by President Clinton? question_answer15) Mention any two political consequences of globalization. question_answer16) Mention any two challenges that India faced just after Independence. question_answer17) What were the fears of tribal population of Orissa and environmentalists about setting up industries in the tribal district? question_answer18) Why did India not join either of the two camps during the Cold War? question_answer19) List any four activities conducted by Bharatiya Kisan Union to pressurize the state for accepting its demands. question_answer20) What was the change in the electoral performance of the Congress Party and BJP from 1984 - 2004? question_answer21) Name any two founders of Non-Aligned Movement (NAM). The first NAM Summit was the culmination of which three factors? question_answer22) Despite the mixed record of democratic experience, the people of all the countries of South Asia share the aspirations of democracy? Explain. question_answer23) List any four steps suggested by the member-states of the U.N. in 2005 in order to make the United Nations more relevant. question_answer24) Explain in brief any four components of India?s security strategy. question_answer26) Define Globalization, Explain any three causes of Globalization. question_answer28) What was the Tibet issue? How did it cause tension between India and China? Explain. (i) Identify and name the person holding in his hand, the placed ?Save Democracy?. (ii) In your opinion, the group of five persons belongs to which political party? (iii) According to the group of five, what are the intentions of the person sitting on ?Dharna?? 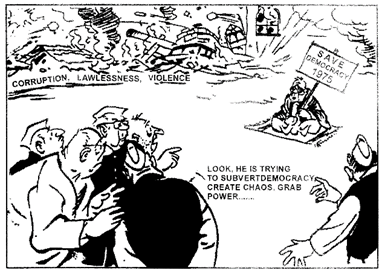 (iv) Which issues responsible for the downfall of democracy are highlighted in the cartoon? question_answer30) When and why did a long phase of coalition politics begin in India? How did the 'New International Economic Order' come into being? Which reforms were proposed by UNCTAD in its report in 1972? Explain any six factors which helped the Soviet Union in becoming a Super-Power after the Second World War. Explain any three constraints on the American Power. The conflict of 1962, in which India suffered military reverses, had long-term implications for India-China relations. Diplomatic relations between the two countries were downgraded until 1976. Thereafter, relations between the two countries began to improve slowly. After the change in China's political leadership from the mid to late 1970s, China's policy became more pragmatic and less ideological. So it was prepared to put off the settlement of contentious issue while improving relations with India. A series of talks to resolve the border issue were also initiated in 1981. (i) Why did India suffer military reverses as a result of the conflict of 1962? (ii) When did the relation between India and China slowly improve? (iii) What was the change in the policy of China in the seventies? (iv) Which efforts were made to resolve the border issue between India and China? Evaluate any three factors that helped the Congress to continue to dominate the Indian political scenario for almost three decades after independence. What was Green Revolution? Mention it's any two positive and any two negative consequences. Explain any six factors which led to the popularity of Indira Gandhi government in the early 1970s. 'The 1977 elections for the first time saw the opposition coming to power at the centre'. Examine any six reasons for this change. How have popular movements contributed to the expansion of democracy rather than causing disruption? 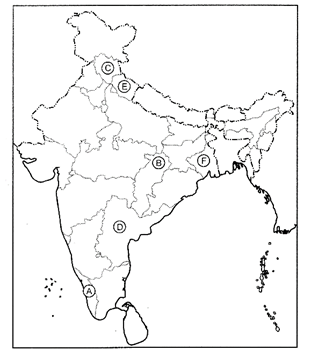 (i) Two states where the Left parties won the majority of Lok Sabha seats. (ii) Two states where the NDA won the majority of Lok Sabha seats. (iii) Two states where the UPA won the majority of seats in Lok Sabha.